Since Wednesday, May 2nd is ‘National Truffle Day’ I decided to make the centers for some Truffles which I will serve to my Mah Jong Group on Wednesday. For the Truffles, I had a small piece of Milk Chocolate and a pound piece of White Chocolate. 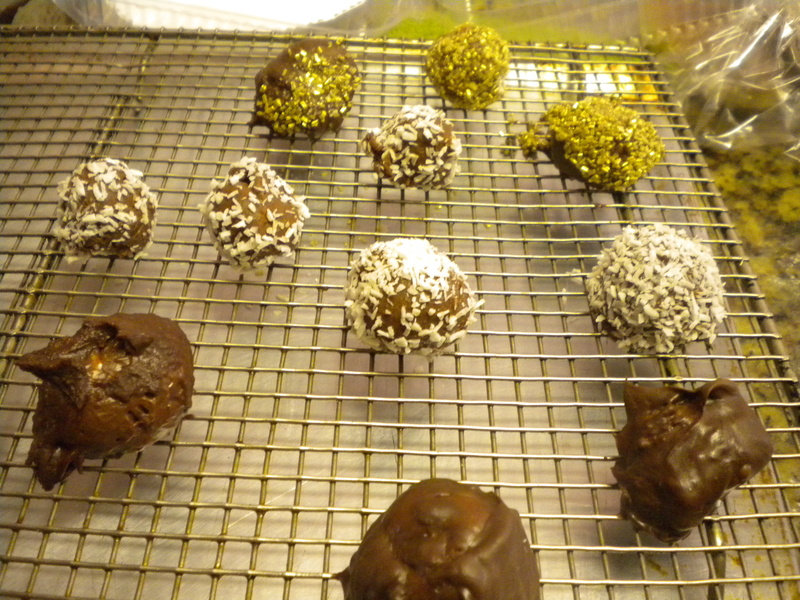 For the Centers of the truffles, I used a couple of Ganache Recipes that I had that were intended for cakes. 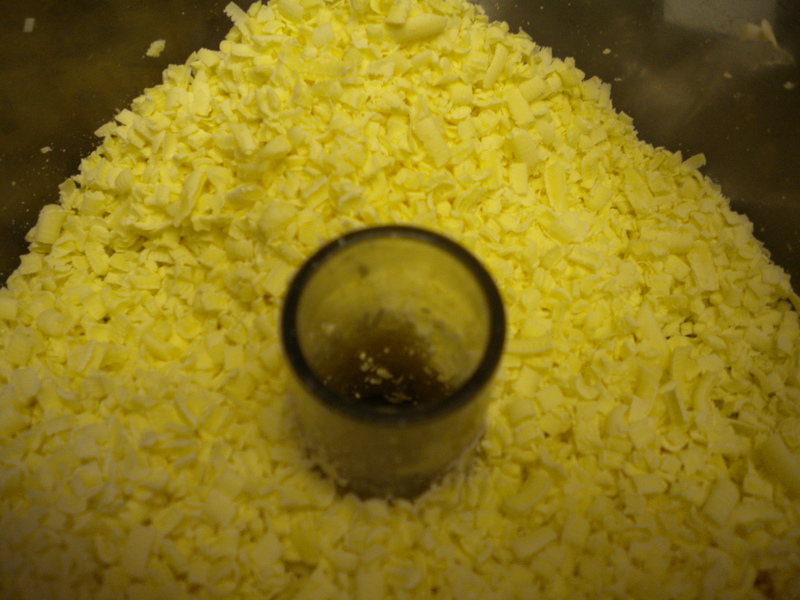 The above ingredients were combined in my food processor and run until everything was well-combined. The mixture was then chilled. 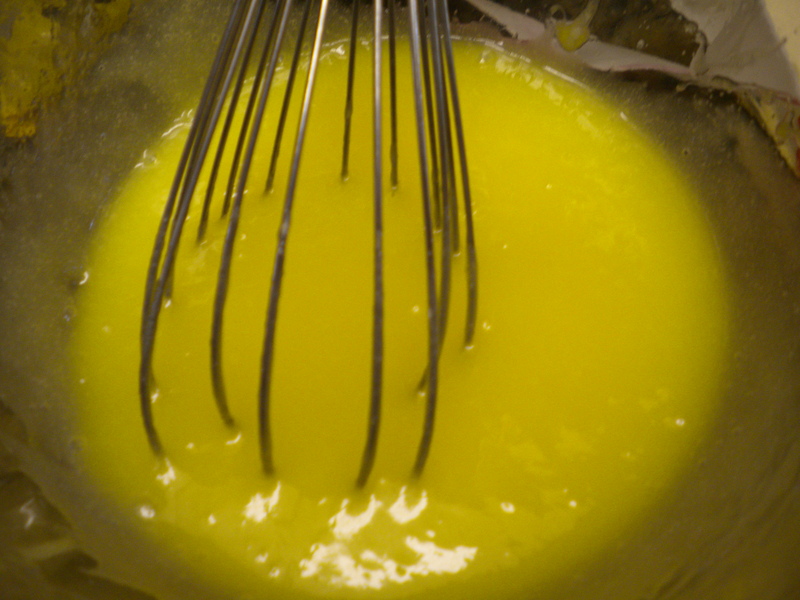 Of course, it became too cold and I had to microwave it for about 30 seconds and then whipped it up with a hand whisk. 1. Heat the Cream with the chopped Chocolate and Butter. 2. 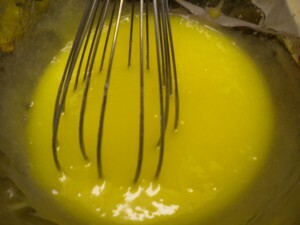 Pour into a shallow dish and chill thoroughly and then whip it up in the food processor along with the Vanilla Extract. Because the resulting mixture was too soft to scoop and roll into balls I ended up adding about 3/8 cup of unsweetened Cocoa and mixing it in. 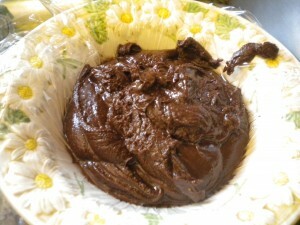 The result was a mixture that I could scoop, roll and dip into melted chocolate. I placed the scooped portions of the Ganache onto a baking sheet that was covered in powdered sugar. When I finished scooping, I placed the balls of chocolate Ganache in the freezer until the next day when I dipped them in melted chocolate. 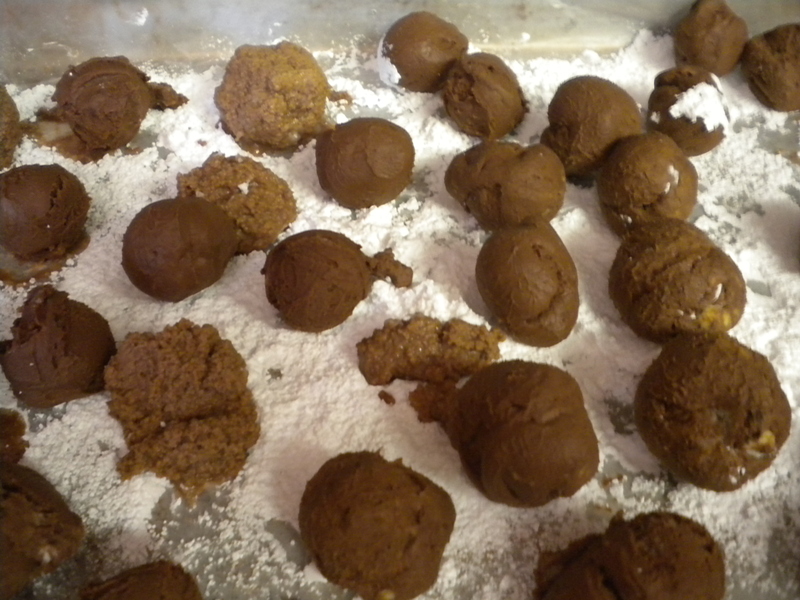 The lighter colored truffles are the Milk Chocolate ones while the darker ones are the White Chocolate fortified with Cocoa. There is actually plastic wrap in the bowl so that I would be able to get the chocolate out. I had to remove the siezed up chocolate from my warmer. Once it completely solidified, I just put the whole thing in a plastic bag and put it aside for a later use. For variety and also for those people who want a little less candy or chocolate, I dipped some into shredded unsweetened Coconut that was finely cut. 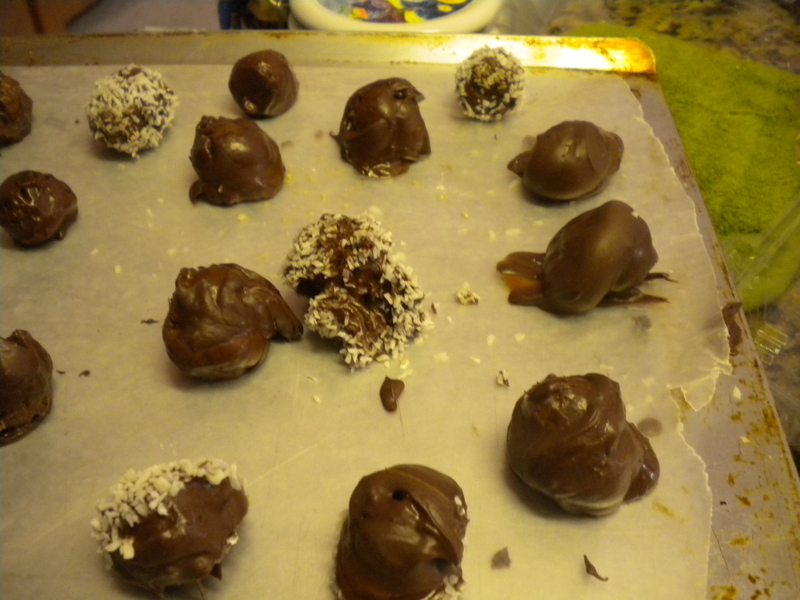 I also rolled some of the chocolate dipped truffles in the Coconut as well. The first batch that I dipped I placed on a rack; they were difficult to get off once the chocolate hardnened, so I switched to waxed paper. 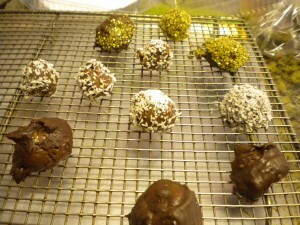 The coated truffles released easily from the waxed paper. Since I wasn’t going to use the Truffles for a couple of days, I placed them in a plastic box with a doily on the bottom and refrigerated them. To serve I will place on a pretty plate with gold doilies. Having sampled a couple of these Truffles, I know that they are truly delicioius and if you are a chocolate lover, they are a dream. 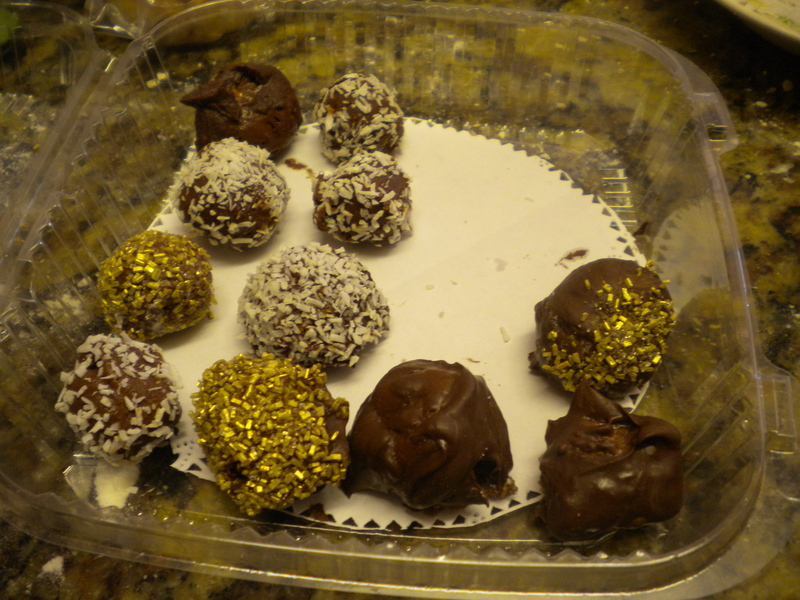 Of course you can get your truffles without nearly as much fuss by going down to your local Godiva or Sees Candy Store and purchasing some. But think of the fun you are missing!